We finally have a good wide path through the house, and have put away contents of some boxes. For some reason, it is taking so much longer to get unpacked after this move. I suppose it is because we have started working from home, and are spending a lot of hours trying to make this work. Kitchen time and cooking is not as convenient as it used to be. We decided to get rid of the microwave. After lots of research, we decided it was a health risk we just couldn't afford. Unfortunately, it means we have to do more 'real' cooking. Maybe it is just my imagination, but I think we are both feeling better, already. We have decided to forego purchased cereal and packaged breakfast bars, too, so I am cooking breakfast now. Here is a recipe I came up with when I didn't have the ingredients called for in another muffin recipe. Charles and I both thought it was so good, I made sure to write it down for the future. It isn't very sweet, but I think it is sweet enough. You could always add 1/2 cup sugar, if you like your muffins really sweet. Or as an alternative, you might try 1/2 cup brown sugar. Preheat oven to 400 degrees. Spray muffin pan with canola baking spray. In a large bowl, measure dry ingredients. Mix in oil, honey, bananas. Stir until about half moistened, and add blueberries. Continue stirring just until completely moistened. Batter will still be lumpy. 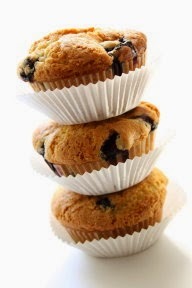 Fill muffin cups until almost full. Bake 10 minutes or until golden and done. Makes 1 ½ dozen muffins. This recipe keeps well in a plastic bag in the bread box. It could also be frozen and popped in a toaster oven to reheat for eating. Yum! Three of my favorite flavors in one muffin! Thanks for the recipe! Mine, too. Thank you for the comment!